Posted by Dave Emory ⋅ January 8, 2019Post a comment Email This Post Print This Post Tweet This! COMMENT: In his book–one of the most important in recent memory–Yasha Levine sets forth vital, revelatory information about the development and functioning of the Internet. The harvesting of data by intelligence services is PRECISELY what the Internet was designed to do in the first place. The harvesting of data engaged in by the major tech corporations is an extension of the data gathering/surveillance that was–and is–the raison d’etre for the Internet in the first place. The big tech companies all collaborate with the various intelligence agencies they publicly scorn and seek to ostensibly distance themselves from. Edward Snowden, the Electronic Frontier Foundation, Jacob Appelbaum and WikiLeaks are complicit in the data harvesting and surveillance. Snowden and other privacy activists are double agents, consciously channeling people fearful of having their communications monitored into technologies that will facilitate that surveillance! 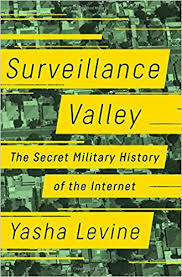 Surveillance Valley by Yasha Levine; Public Affairs Books [HC]; Copyright 2018 by Yasha Levine; ISBN 978-1-61039-802-2; p. 7.
. . . . In the 1960s, America was a global power overseeing an increasingly volatile world: conflicts and regional insurgencies against US-allied governments from South America to Southeast Asia and the Middle East. These were not traditional wars that involved big armies but guerilla campaigns and local rebellions, frequently fought in regions where Americans had little previous experience. Who were these people? Why were they rebelling? What could be done to stop them? In military circles, it was believed that these questions were of vital importance to America’s pacification efforts, and some argued that the only effective way to answer them was to develop and leverage computer-aided information technology. The Internet came out of this effort: an attempt to build computer systems that could collect and share intelligence, watch the world in real time, and study and analyze people and political movements with the ultimate goal of predicting and preventing social upheaval. . . .
Surveillance Valley by Yasha Levine; Public Affairs Books [HC]; Copyright 2018 by Yasha Levine; ISBN 978-1-61039-802-2; p. 15.
. . . . Ranch Hand got going in 1962 and lasted until the war ended more than a decade later. In that time, American C-123 transport planes doused an area equal in size to half of South Vietnam with twenty million gallons of toxic chemical defoliants. Agent Orange was fortified with other colors of the rainbow: Agent White, Agent Pink, Agent Purple, Agent Blue. The chemicals, produced by American companies like Dow and Monsanto, turned whole swaths of lush jungle into barren moonscapes, causing death and horrible suffering for hundreds of thousands. Operation Ranch Hand was merciless, and in clear violation of the Geneva Conventions. It remains one of the most shameful episodes of the Vietnam War. Yet the defoliation project is notable for more than just its unimaginable cruelty. The government body at its lead was a Department of Defense outfit called the Advanced Research Projects Agency (DARPA). Born in 1958 as a cash program to protect the United States from a Soviet nuclear threat from space, it launched several groundbreaking initiatives tasked with developing advanced weapons and military technologies. Among them were project Agile and Command and Control Research, two overlapping ARPA initiatives that created the Internet. . . . When Putin called the Internet a “CIA project” (https://www.theguardian.com/world/2014/apr/24/vladimir-putin-web-breakup-internet-cia), the only thing he got wrong was the agency (DARPA/DIA). Actually, he was only partially wrong. The Broadcasting Board of Governors–a CIA “derivative”–is deeply involved with all of this, including: the development and dissemination of the U.S. intelligence-created Tor network (used by WikiLeaks, recommended by Eddie “The Friendly Spoook” Snowden and Jacob–“I wish Ayn Rand was still alive so I could (expletive deleted) her”–Applebaum, and the Electronic Frontier Foundation). The book is REALLY important. It doesn’t go into the overtly fascist character and alliances of Snowden, Assange and Greenwald, but reveals that the so-called “privacy activists” are double agents. I want to thank you for your implicit anti-fascist work “Agent Orange and the Internet: The Spawn of Project Agile” which is needed to inform a largely uninformed public of just these sorts of threats.